The facility is a place where everything revolves around the construction of the human body. Whether it’s cutting room teaching and anatomical dissection, or high clinical training and even state-of-the-art scientific research. 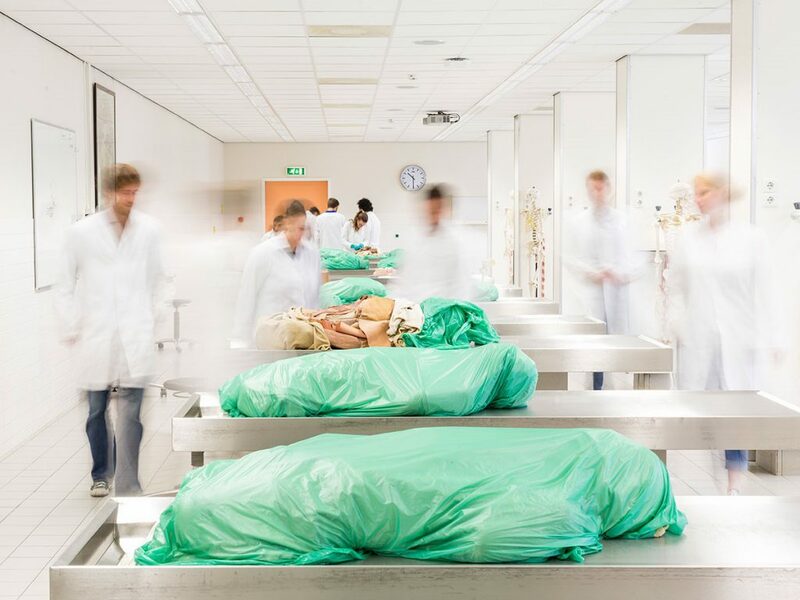 The range of activities that can be organized thanks to the unique gift of body donors have in common that they contribute significantly to the advancement of medical education and research. To reinforce this core value of the body donation the Dissection Rooms are accessible to all (para and bio-) medical students and professionals who can demonstrate that the use of the facility contributes to better education and training, or the expansion of scientific knowledge. Dissection Rooms are located in the basement of the Medical Faculty and cover an area of approx. 1000 square m in which three dissection rooms (1 large and 2 smaller) and a conference room are housed. There are three methods of bodypreservation (Fresh Frozen, fix embalming, Thiel embalming) each has it’s own ideal scope and purpose. The facility has access to hundreds of high quality anatomical specimens and models, covering together the entire body, literally from head to toe. All activities at the site of the Dissection Rooms must be requested through the application form. There are different application forms for education and research. The applicant must be in possession of a completed bachelor’s degree in medical, biomedical or paramedical training. Applications are assessed by a review board. For more information and the applicationforms, please mail Dissection Room Anatomy.